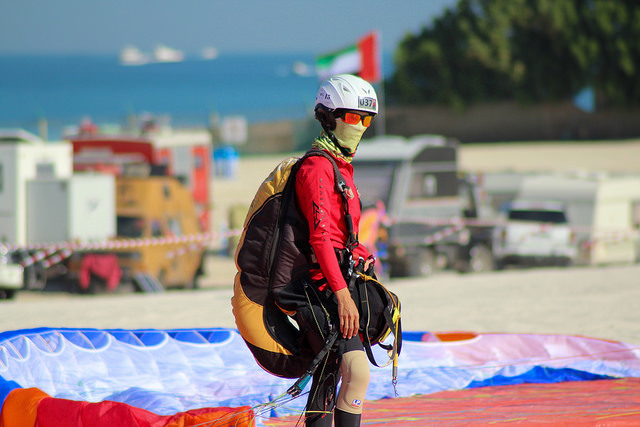 The Paragliding Accuracy competition reached a critical stage yesterday (December 3), with the completion of the fifth round at the Beach Dropzone. Under the rules, pilots drop their worst score, which can cause the leader board to change dramatically. And it did! With 19 of the world’s best paragliding accuracy pilots travelling from 14 nations to take part, it was always going to be a tight competition. Goran Djurkovic from Serbia was leading for the first two rounds, scoring just 1cm and 2cm respectively. He then dropped a 5cm score, allowing Tanapat Leangaiem from Thailand to take the lead. But in the fourth round, Leangaiem scored 5cm to Djurkovic’s 3cm, putting Djurkovic back in the top spot. Battle commenced for the fifth round and Djurkovic came out on top with another 1cm score to Leangaiem’s 5cm. Further down the field, Chinese competitor, Qiang Ma took a disappointing 22cm in the first round, but scored brilliantly in the next four (0cm, 2cm, 2cm, 3cm). As a result of the dropped score after round five, he currently holds joint first place with Djurkovic. Many times world champion, Matjaz Feraric suffered a similar fate, scoring badly on the first round, but subsequently rising to joint third place with George Cotet of Romania after five rounds, pushing Leangaiem into fifth. Just 1cm behind, in joint sixth place are Martin Jovanoski from FYR Macedonia and Darumaka Rajasa of Indonesia. Standards are high here at FAI World Air Games. There were no falls until the fourth round, and the majority of the 95 flights flown so far have an accuracy of less than 15cm. Four pilots have scored Dead Centres (0cm) including Japanese pilot, Yoshiki Oka, still competing at the highest level at the age of 68. Leading the women’s competition is Nannapat Phuchong from Thailand, in eleventh place overall. She is expected to improve her overall standing as competitors continue to battle it out. The event continues today, having started at 7am.